My journey through India continued last night… okay, not the actual exotic country, itself, but the FLAVOR of India. The next flavor I brewed (from the sample pack they sent us to review) was Jaipur Avenue Chai Tea Mix Vanilla . I wasn’t sure what to expect with this one, actually. Chai Tea Lattes and the flavor of vanilla are two of my favorite things in this world. I just wasn’t sure how well they’d play together. However, I was anxious to find out! The two flavors don’t fight it out, which is what I expected. The Chai flavor is, as always, a very generous host to the visiting flavor – in this case Vanilla. In fact, Chai steps aside almost completely – leaving behind an AMAZING deliciousness that tastes like tea’s version of coffee’s Vanilla Latte. However, most vanilla lattes don’t have the strong, pure, and “expensive-tasting” vanilla flavor that makes Jaipur Avenue’s Vanilla Chai Tea Mix so exceptional. Even if Chai tea, somehow, isn’t your “cup of tea,” you HAVE to try this drink mix. I work with words all day in our web publishing business, but they’re completely elusive sometimes. No matter where I look, I can’t find the ones I need. This is one of those times! This is simply outstanding and I wish each and every one of you could try it. Actually, I wish you could try EACH of Jaipur Avenue’s Chai Tea mixes. I, personally, do food & drink reviews almost daily between this blog and my food blog but it’s been a while since I was excited about a product as I am now. 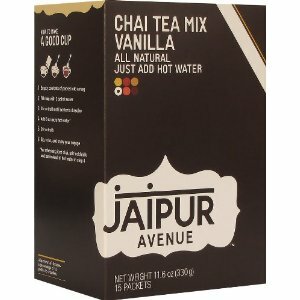 Buy Jaipur Avenue Chai Tea Mix Vanilla on Amazon. Previous Post: « Jaipur Avenue Cardamom Chai Tea Mix: Excellent!